How would you handle this case? Read the facts and see if the judge agrees YOU MAKE THE CALL 8 ©2019 Thomson Reuters Canada Ltd. All rights reserved. No part of this publication may be reproduced, stored in a retrieval system, or transmitted, in any form or by any means, electronic, mechani- cal, photocopying, recording or otherwise, without the prior written permission of the publisher. The publisher is not engaged in rendering legal, accounting or other professional advice. If legal advice or other expert assistance is required, the services of a competent professional should be sought. The analysis contained herein represents the opinion of the authors and should in no way be construed as being either official or unofficial policy of any governmental body. GST #897176350 Emplo y ment Law Today www.employmentlawtoday.com Published biweekly 22 times a year Subscription rate: $299 per year CUSTOMER SERVICE Tel: (416) 609-3800 (Toronto) (800) 387-5164 (outside Toronto) E-mail: customersupport.legaltaxcanada@tr.com www.employmentlawtoday.com Thomson Reuters Canada Ltd. One Corporate Plaza 2075 Kennedy Road, Toronto, Ontario, Canada M1T 3V4 Director, Media Solutions, Canada: Karen Lorimer Publisher/Editor in Chief: Todd Humber Editor: Jeffrey R. Smith E-mail: Jeffrey.R.Smith@tr.com Sales Manager: Paul Burton Email: paul.burton@tr.com Phone: (416) 649-9928 Marketing Co-ordinator: Keith Fulford Email: keith.fulford@tr.com Phone: (416) 649-9585 ©2019 Thomson Reuters Canada Ltd. All rights reserved. No part of this publication may be reproduced, stored in a retrieval system, or transmitted, in any form or by any means, electronic, mechani- cal, photocopying, recording or otherwise, without the prior written permission of the publisher. The publisher is not engaged in rendering legal, accounting or other professional advice. If legal advice or other expert assistance is required, the services of a competent professional should be sought. The analysis contained herein represents the opinion of the authors and should in no way be construed as being either official or unofficial policy of any governmental body. GST #897176350 Emplo y ment Law Today Canad ad ad ad ad ad a ian an an www.employmentlawtoday.com Published biweekly 22 times a year Subscription rate: $299 per year CUSTOMER SERVICE Tel: (416) 609-3800 (Toronto) (800) 387-5164 (outside Toronto) E-mail: customersupport.legaltaxcanada@tr.com www.employmentlawtoday.com Thomson Reuters Canada Ltd. One Corporate Plaza 2075 Kennedy Road, Toronto, Ontario, Canada M1T 3V4 Director, Media Solutions, Canada: Karen Lorimer Publisher/Editor in Chief: Todd Humber Editor: Jeffrey R. Smith E-mail: Jeffrey.R.Smith@tr.com Sales Manager: Paul Burton Email: paul.burton@tr.com Phone: (416) 649-9928 Marketing Co-ordinator: Keith Fulford Email: keith.fulford@tr.com Phone: (416) 649-9585 YOU MAKE THE CALL Was the dismissal discriminatory? OR Was the dismissal legitimate? IF YOU SAID the dismissal was legitimate, you're right. e board found that Sport Chek provided suffi cient evidence —through emails between upper management and hu- man resources — that the company planned to dismiss N.C. several months before it actu- ally happened and before N.C. began his cam- paign to do something about shoplifters. e termination was placed on hold for budgetary reasons and then the investigation into the in- cident at the store, but the decision to termi- nate wasn't aff ected by them, said the board. e board also found that N.C.'s corre- spondence with Sport Chek management re- garding his health and safety concerns were "at least partly predicated on the promotion of a new business venture" that he wanted to pitch to executives. In addition, a provincial investigator determined that Sport Chek's violence prevention policies were compliant with health and safety legislation. 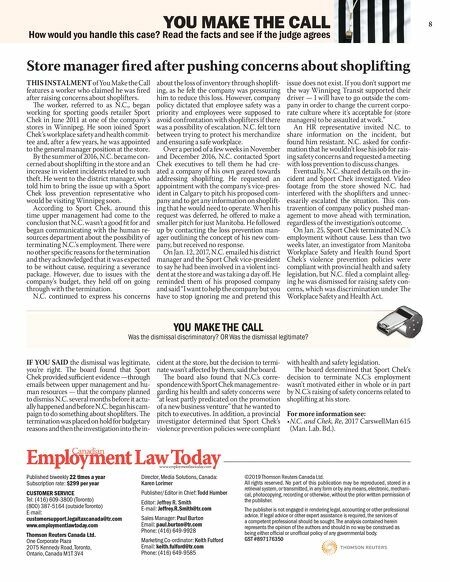 e board determined that Sport Chek's decision to terminate N.C.'s employment wasn't motivated either in whole or in part by N.C.'s raising of safety concerns related to shoplifting at his store. For more information see: • N.C. and Chek, Re, 2017 CarswellMan 615 (Man. Lab. Bd.). Store manager fi red after pushing concerns about shoplifting THIS INSTALMENT of You Make the Call features a worker who claimed he was fi red after raising concerns about shoplifters. e worker, referred to as N.C., began working for sporting goods retailer Sport Chek in June 2011 at one of the company's stores in Winnipeg. He soon joined Sport Chek's workplace safety and health commit- tee and, after a few years, he was appointed to the general manager position at the store. By the summer of 2016, N.C. became con- cerned about shoplifting in the store and an increase in violent incidents related to such theft. He went to the district manager, who told him to bring the issue up with a Sport Chek loss prevention representative who would be visiting Winnipeg soon. According to Sport Chek, around this time upper management had come to the conclusion that N.C. wasn't a good fi t for and began communicating with the human re- sources department about the possibility of terminating N.C.'s employment. ere were no other specifi c reasons for the termination and they acknowledged that it was expected to be without cause, requiring a severance package. However, due to issues with the company's budget, they held off on going through with the termination. N.C. continued to express his concerns about the loss of inventory through shoplift- ing, as he felt the company was pressuring him to reduce this loss. However, company policy dictated that employee safety was a priority and employees were supposed to avoid confrontation with shoplifters if there was a possibility of escalation. N.C. felt torn between trying to protect his merchandize and ensuring a safe workplace. Over a period of a few weeks in November and December 2016, N.C. contacted Sport Chek executives to tell them he had cre- ated a company of his own geared towards addressing shoplifting. He requested an appointment with the company's vice-pres- ident in Calgary to pitch his proposed com- pany and to get any information on shoplift- ing that he would need to operate. When his request was deferred, he off ered to make a smaller pitch for just Manitoba. He followed up by contacting the loss prevention man- ager outlining the concept of his new com- pany, but received no response. On Jan. 12, 2017, N.C. emailed his district manager and the Sport Chek vice-president to say he had been involved in a violent inci- dent at the store and was taking a day off . He reminded them of his proposed company and said "I want to help the company but you have to stop ignoring me and pretend this issue does not exist. If you don't support me the way Winnipeg Transit supported their driver — I will have to go outside the com- pany in order to change the current corpo- rate culture where it's acceptable for (store managers) to be assaulted at work." An HR representative invited N.C. to share information on the incident, but found him resistant. N.C. asked for confi r- mation that he wouldn't lose his job for rais- ing safety concerns and requested a meeting with loss prevention to discuss changes. Eventually, N.C. shared details on the in- cident and Sport Chek investigated. Video footage from the store showed N.C. had interfered with the shoplifters and unnec- essarily escalated the situation. is con- travention of company policy pushed man- agement to move ahead with termination, regardless of the investigation's outcome. On Jan. 25, Sport Chek terminated N.C.'s employment without cause. Less than two weeks later, an investigator from Manitoba Workplace Safety and Health found Sport Chek's violence prevention policies were compliant with provincial health and safety legislation, but N.C. fi led a complaint alleg- ing he was dismissed for raising safety con- cerns, which was discrimination under e Workplace Safety and Health Act.